Who is The Best Base Stealer in MLB? After several seasons of watching Jacoby Ellsbury, Carl Crawford and B.J. Upton run amok around the A.L. East, it’s been refreshing to see elite speed on the Yankees in the form of Brett Gardner (side note: have you ever seen the actual definition of the word amok? Less mischievous and more sinister than I would have guessed. A manic urge to murder. Yikes.) As a team, the Yankees have been a better than average base stealing team for the past several years (ranking 7th in the A.L. in 2009, 4th in 2008, 4th in 2007, 2nd in 2006 and 6th in 2005). 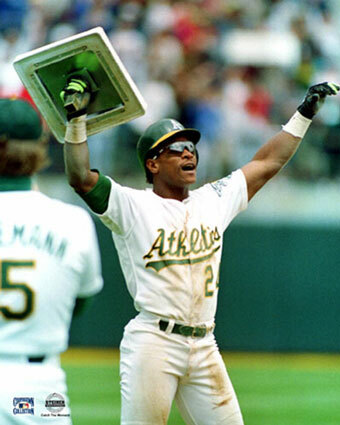 However, that’s more due to the fact that they featured so many players capable of stealing bases, with none being at an elite level. Jeter, Damon, Abreu, and A-Rod have all been capable of 20-30 steals in their time as Yankees, and both Joe Girardi and Joe Torre have been more than willing to let them run. None of those players possess the base stealing potential or the incredible speed that Brett Gardner does. While it is certainly way too early to say Brett Gardner is the best base stealer in baseball (he hasn’t even played a full major league season), his ability and potential to take that title have made me wonder just who is. Aside from the list of players above, there are a number of others who belong in the discussion: Jose Reyes (operating on the assumption that his bionic legs are intact), Jimmy Rollins, Brian Roberts, Michael Bourn, Ichiro, Willy Taveras and Chone Figgins. A few others perhaps worth mentioning but who I’m not factoring in the the discussion are Rajai Davis and Nyjer Morgan (like Gardner they haven’t had enough time to fully display their skills in the majors but will probably be among the best in the years to come), and Carlos Gomez and Joey Gathright (neither of whom plays enough due to other limitations to make full use of their ability… but there’s always this). Unlike finding data for batting with men on base, finding data for base running with other men on base has proven to be a bit difficult, so this quick formula neglects it (as well as neglecting a ton of other factors). Even with a decent margin for error I think it will be a helpful tool in figuring out who the best base stealer in baseball is. By the way, for a running total of spring training SB’s you can click here. In spite of all of his missed time Jose Reyes has the highest total, followed by Carl Crawford. 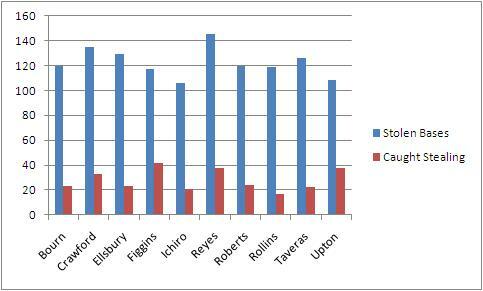 Figgins was caught the most in the group, followed by Reyes and Upton. Jimmy Rollins has an incredible 87.5% success rate. Upton and Figgins probably run more than they should, stealing below the magic number of 75% success. Now as for who makes the most out of their skills. Willy Taveras is not very good at getting on base. His career OBP is a hilarious .321, easily the lowest out of of the entire group. 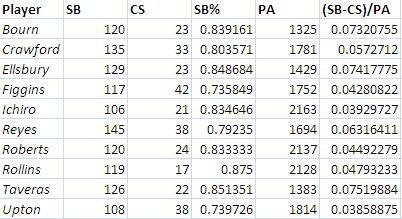 Yet he still produces more successful steals (discounting for CS) per plate appearance than any of the others. What that’s saying is that if Taveras had even average on base ability, say somewhere in the range of .340-.350, you could be looking at a guy who steals 80 bases annually. So who do we conclude as the best base stealer in baseball? I’m going to have to go with Taveras. Among all of the top base stealers he has the second best success rate, which he maintains even while taking off more liberally than any of the others. In a perfect world Brett Gardner turns into a base stealing clone of Rollins, Ellsbury or Taveras, hopefully getting on base more often than any of them (and playing better defense, in the case of Ellsbury). Best case scenario is that Gardner turns into a 100-110 OPS+ player who steals a ton of bases and plays excellent defense at a premium position in center. Worst case would seem to be a much better version of Gathright; a defensive replacement and pinch runner who can be valuable depending on the situation and proper use. By the way I think manic urges to murder needs to become a more frequently used post tag. I will use it every time I write an article ranting about Mike Lupica. thzxUnlike finding data for batting with men on base, finding data for base running with other men on base has proven to be a bit difficult. such an in depth blog about baseball could only come from someone that thinks dinosaurs are a hoax..
My monkey parents taught me to use the internet. Wait I mean apes, we didn’t evolve from tailed creatures! my oh my… ignorance is bliss huh? My impression after reading your blog is that you think you are a lot smarter than you actually are. well at least I try.. My impression of you isn’t all that great either. I’m sorry that I have conscious thoughts and there is a baseball game going on in your head. Your opinion of my blog isn’t shared by many people who’ve discussed the topics on there with me. Whether they agree or not. I’m pretty certain that your not quite up to botany/organic chemistry caliber, which is what I have degrees in…. I’m really sorry that I posted a comment on your silly blog..
And please come back and read, I love to have new readers! Oh and the dickwaving of your degrees is hilarious. No one in the world is has a higher opinion of themselves than I do and even I find that to be hilariously over the top. 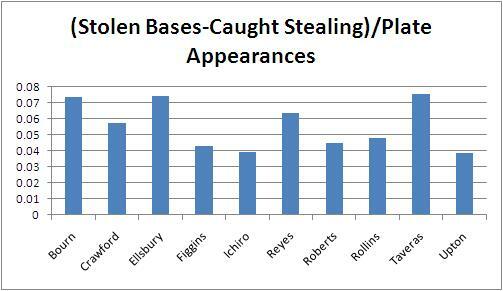 Um, I’m like three years too late, but I liked the graphs on stolen bases. On the other hand, I don’t believe in dinosaurs either, except the ones in that lost valley where all the people in movies go.